Remé-Antonia Grefalda is a published author of a poetry collection, baring more than soul, The Other Blue Book: On The High Seas of Discovery, on the little known world of paralegals, and co-authored a Ford Foundation report, Towards A Cultural Community: Identity, Education and Stewardship in Filipino American Performing Arts. She is the recipient of the Philippines Palanca Award for her full length play, In the Matter of Willie Grayson, produced and staged at Howard University in Washington, D.C.
Aileen’s works have appeared or are forthcoming in Fellowship Magazine, Galatea Resurrects, Positively Filipino, and the anthology Hanggang sa Muli: Homecoming Stories for the Filipino Soul (Tahanan Books, 2011). TRAJE DE BODA, her first poetry collection, was published by Meritage Press in 2010. Her poem-sculpture, “The Boatman’s Book Spine Poetry,” was included in the art exhibition, Chromatext Rebooted, at the Cultural Center of the Philippines (November 2015 to January 2016). 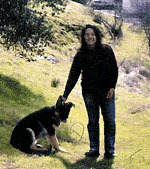 She was one of top five finalists for Poet Laureate of San Mateo County. Eileen has released 18 print, four electronic and 1 CD poetry collections, an art essay collection, a poetry essay/interview anthology, a short story book and two novels. 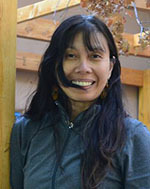 Recipient of the Philippines’ National Book Award for Poetry for her first poetry book Beyond Life Sentences, she has exhibited visual poetry and visual art throughout the United States and Asia. She’s also edited or co-edited six books of poetry, fiction and essays. 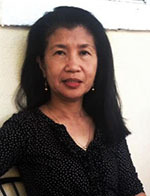 In poetry, Ms. Tabios has crafted a body of work that is unique for melding ekphrasis with transcolonialism. Inventor of the poetic form “hay(na)ku“, her poems have been translated into Spanish, Italian, Tagalog, Japanese, Portuguese, Polish, Greek, Paintings, Video, Drawings, Visual Poetry, Mixed Media Collages, Kali Martial Arts, Music, Modern Dance and Sculpture. As part of her poetry-as-performance approach, she blogs as the “Chatelaine” at http://angelicpoker.blogspot.com and edits GALATEA RESURRECTS, a popular poetry review journal at http://galatearesurrects.blogspot.com. 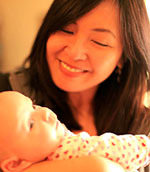 Geej has been a graphic designer since 1988, and a web-designer since 1993. She is also a peace worker, popular educator, theatre artist, songwriter-musician, cultural researcher, and writer. As theater and music artist, Geej has traveled widely across the Philippines, Asia and Europe performing, conducting workshops, and delivering talks on Mindanao and Philippines arts and culture. As a web denizen, Geejay was finalist in the 2000 Philippine Webawards, judge in 2001, and semi-finalist in 2003. 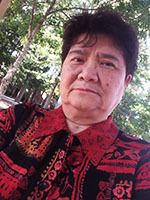 Minerva G. Manalac is a Computer Science graduate from the University of Maryland. She likes to stay up late nights, goes on long afternoon walks daily, likes to drink coffee only before 9am, and watches opera when she can afford it. She lives in Northern VA where armed with her laptop, tablet and cellphone, she plans to share her skills and knowledge hopefully making the world a much better place before she dies.